Aleebaba Chocolate Pusher Arcade Machine is a video redemption, shooting style game that rewards players with chocolate coins rather than tickets or prizes. The aim of the game is to press the yellow button on the control panel to shoot your virtual coins at the rotating figures and destroy them! Players must also aijm to knock down the box that shows up and when they do and key will show on the screen. Once all 5 keys have been found players will enter the second game. When players lose the game, their scores will be paid out in chocolate coins from the prize box. This fun and exciting game reinvents the chocolate prize machine, which is frequently packaged as a crane machine with a pusher platform. The simple and straight-forward gameplay, mixed with game objectives and goals to be reached over stages makes this great for players of all ages. The Aleebaba Chocolate Pusher arcade machine is suitable and earns well in a variety of locations and it's bright cabinet and captivating video redemption features will draw in players from all across the floor. The aim of the game is to press the yellow button on the control panel to shoot your virtual coins at the rotating figures and destroy them! Players must also aijm to knock down the box that shows up and when they do and key will show on the screen. Once all 5 keys have been found players will enter the second game. When players lose the game, their scores will be paid out in chocolate coins from the prize box. This fun and exciting game reinvents the chocolate prize machine, which is frequently packaged as a crane machine with a pusher platform. The simple and straight-forward gameplay, mixed with game objectives and goals to be reached over stages makes this great for players of all ages. 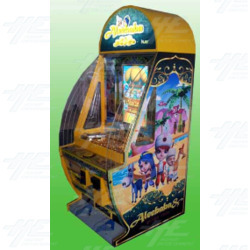 The Aleebaba Chocolate Pusher arcade machine is suitable and earns well in a variety of locations and it's bright cabinet and captivating video redemption features will draw in players from all across the floor.